This is a close up view look inside the left side window. This picture shows the assembled fuselage. 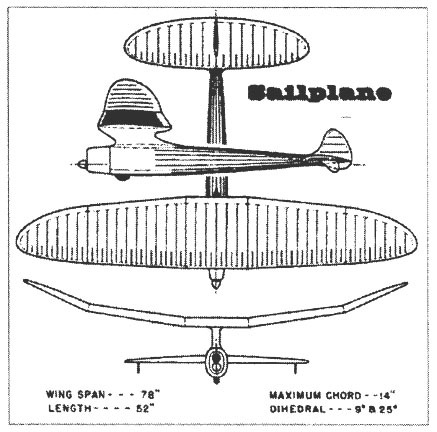 This shows the Sailplane’s (SP) bulkhead No. 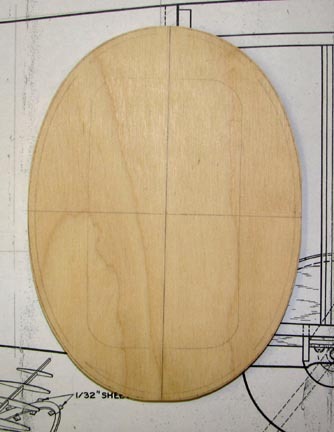 1 laid out on a piece of 5-ply 1/4″ Birch plywood. I added a 3/32″ stand off to the contour to account for the fuselage’s 3/32″ planking to make the SP firewall as shown below. 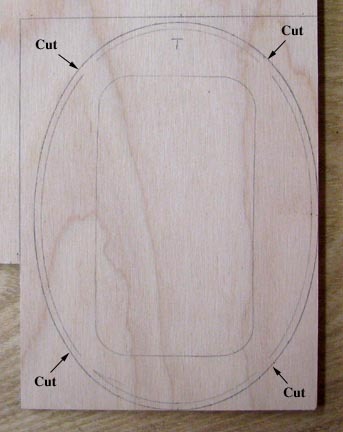 My friend Jerry Burk used his band saw to cut out the 1/4″ plywood firewall shown below for me. If you recall, I decided to build the Sailplane with a two-wheel landing gear which has a double strut as shown below. The aft wire strut will be made of 1/8″ piano wire and structure for the bottom of the fuselage has to be provided to anchor this wire. One further condition is that I want the entire wire landing gear removable. I will refer to this anchor as the retaining member and it was made out of spruce as shown below. The bottom member is 1/8″ X 1/2″ spruce. 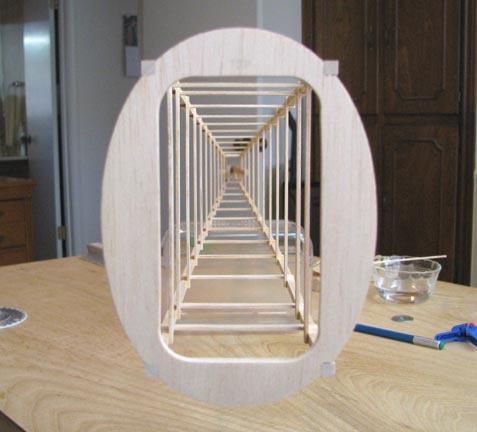 I glued two 1/8″ X 3/16″ spruce strips to the top, leaving a 1/8″ square slot down the center. I cut three 1/4″ wide brass strips and attached them to the retaining member using two 2-56 cap screws in each. Then I glued 1/16″ X 3/16″ spruce pieces between the brass straps and the ends. The picture below shows the completed spruce retaining member with a piece of 1/8″ piano wire in the slot. Notice the brass straps are numbered 1 through 3 from left to right. 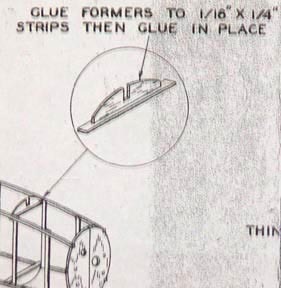 This shows the spruce retaining member with brass straps and 1/8″ wire removed. 6 holes that were drilled with a No. 50 drill bit and threaded with a 2-56 tap to receive the six 2-56 cap screws. 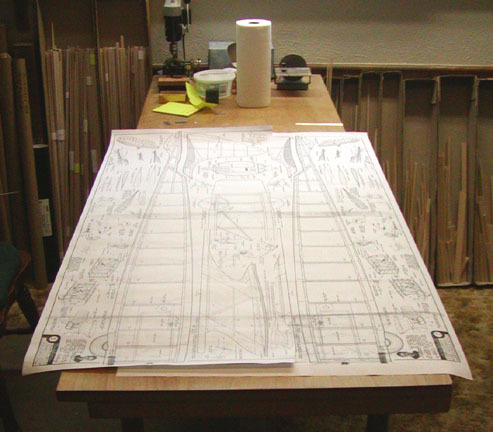 Notice the 3/16″ overhang on each that will be glued onto the top of the bottom longeron. 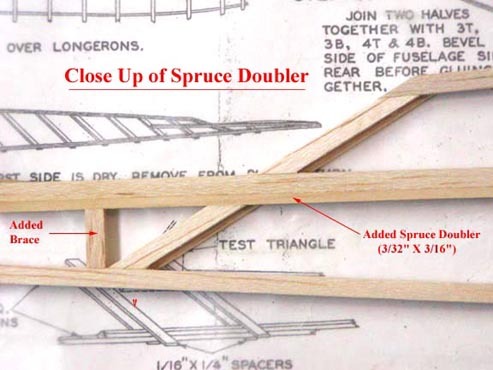 3/16″ spruce doublers were incorporated on top of the bottom longeron to trap the 3/16″ overhang on the retaining member in place as shown in the side view below. Some additional structure has also been added. This is a bottom view showing the completed retaining member in place. Next I laid out the locations of a set of Goldberg composite T-mount’s and the 5/32″ piano wire landing gear front strut on the firewall view of the Sailplane plan as shown below. The vertical location shown for the landing gear is dictated by a number of constraints including the fuel tank. 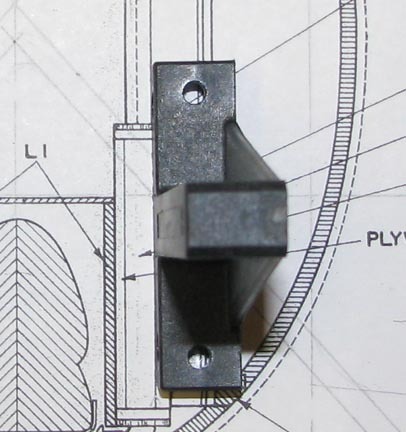 The picture below shows a close up of the right T-mount looking aft and where the 5/32″ piano wire landing gear front strut has to pass behind it. As you can see, the 1/4″ aluminum spacers that go between the firewall and the T-mounts for the SP will require a 5/32″ slot machined out the back at angle in order to trap the landing gear wire between the aluminum spacer and the firewall. Two additional metal straps will be used on either side of the wire’s apex to further secure it to the firewall. I am having some second thoughts about the 5/32″ front strut wire. 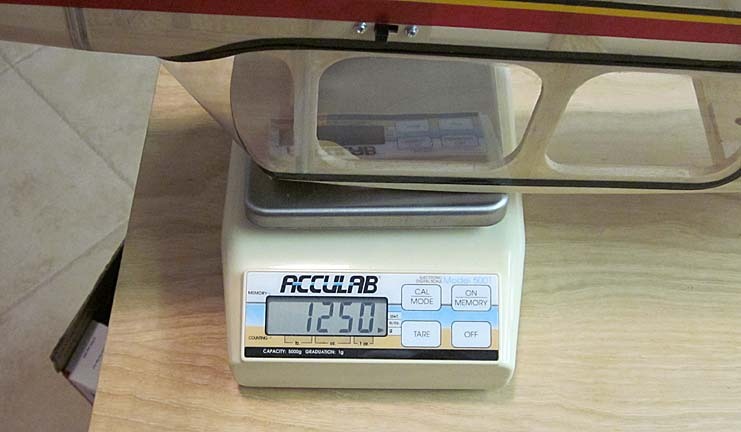 It very well may be that 1/8″ is plenty strong enough. What do you think? 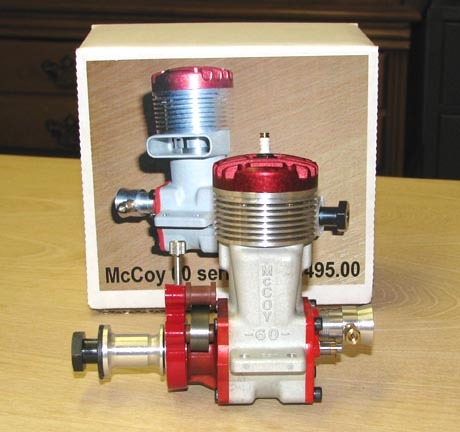 The Series 20 McCoy 60 engine that I ordered from Woody Bartelt was just delivered in today’s mail. I could not be more pleased with the engine shown below. Its serial number is B37. The Sailplane has remained somewhere in back of mind most of my modeling life. I purchased a copy of the original Comet plans for the Sailplane in the late 1990’s just to have them to look at. Then sometime in the early 2000’s Bob Holman laser cut the parts for the Comet Sailplane plans and I bought the parts, again just to have them. Building this model would require a long term commitment of time and focus. And then there is the single wheel retractable landing gear, which has always been a stumbling block for me. 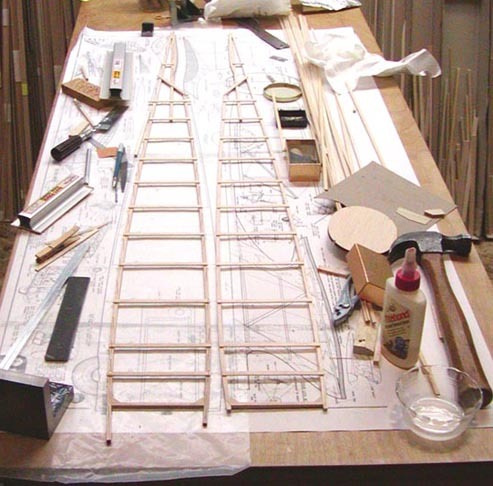 In November of 2004, I decided that I would build the fuselage sides of the Sailplane just to see how Golderg’s “ladder” construction on the fuselage side frames would work out. In order to build both sides, the first thing I did was to have a reverse copy made of the fuselage profile plan as shown below. them on top of two of the fuselage cross pieces. 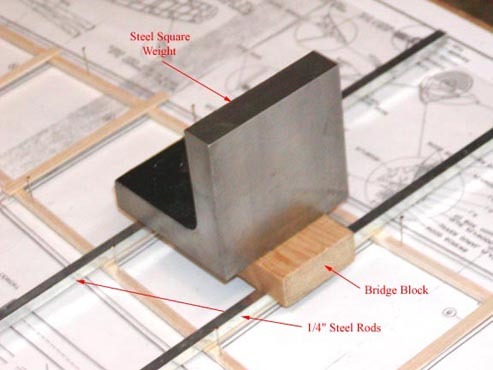 I laid a short length of 3/4″ x 2″ pine bridge block across the two rods and placed my 3″ steel square cube on the block for weight. I let the Titebond dry about 5 minutes, which was enough to hold the cross members in place. Then I went to the next cross member and did the same thing all over again until I was finished. The resulting side lay up is shown below. Then using the reverse copy of the fuselage profile plan the other side was laid up as shown below. The aft end of the structure appeared to be weak so I decided to reinforce the longeron under the stab with a 3/32″ X 3/16″ spruce doubler. This shows thespruce doubler on the top longeron under the stab clamped in place while the glue dries. This shows a close up of the spruce doubler glued in place. Notice that a portion of the diagonal truss member had to be removed to allow the spruce doubler to fit down into place. I also added the short 3/16″ square brace between the spruce doubler and the bottom longeron. 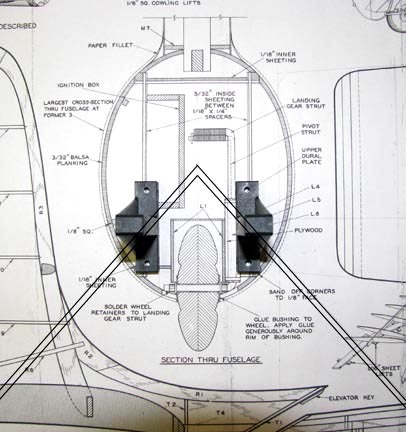 This compares the untrimmed left fuselage side on top with plan construction to the trimmed right fuselage side on the bottom with the added spruce doubler and short brace between the spruce doubler and the bottom longeron. Notice that the spruce doubler runs the full length of the longeron under the stab. The Comet Sailplane plan does not show a top view of the fuselage. 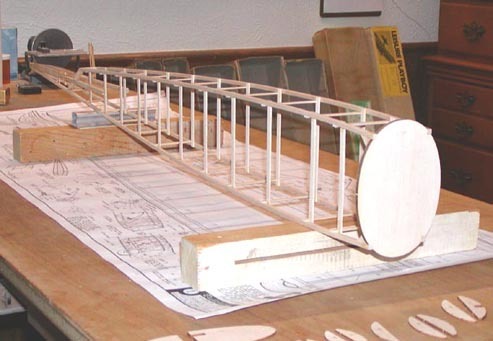 :O< Instead, the top and bottom former pieces are first glued to cross strips and then glued in place, which sets the width of the fuselage sides as shown in this picture taken from the plan. 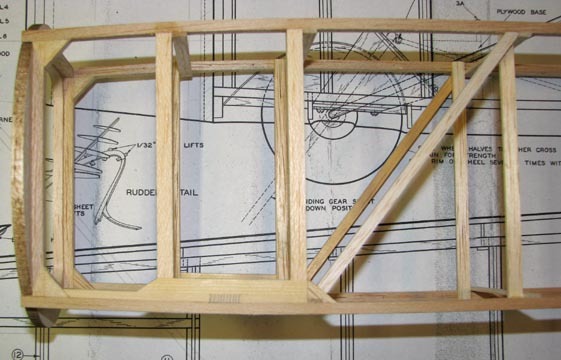 Since it was my intent to build the fuselage’s primary frame and then stop the project, I did not want to put on the former pieces with no stringers because they would be subject to getting knocked off while in storage. So I joined the sides by using the former pieces as spacers to position the width of the sides and then gluing in the cross strips, which turns out to be a bit of a trick if you think about what it takes to do this. 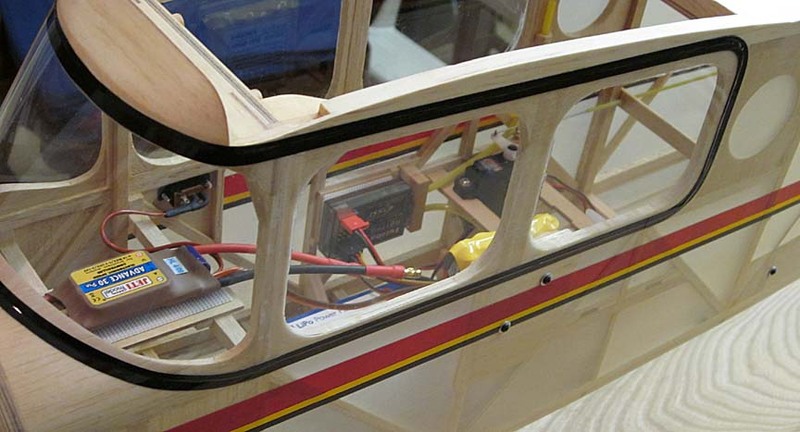 This right front quarter picture of the fuselage’s primary shows the two fuselage sides joined together with the front balsa bulkhead glued in place. The structure turned out very straight and very square. 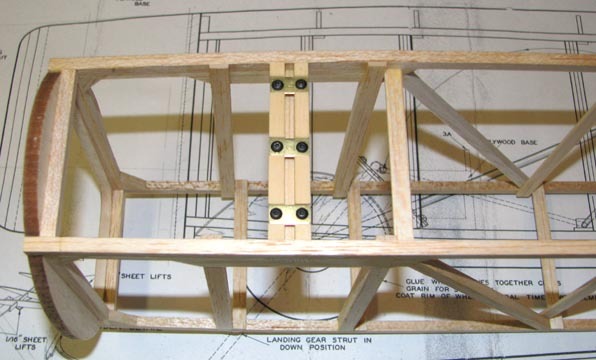 It is extremely light due to the thin 1/16″ X 1/4″ balsa strips used for both the vertical and horizontal truss members. The frame appears short and fat due to picture angle. Notice the former cross pieces in the foreground that I used to set the frame width. 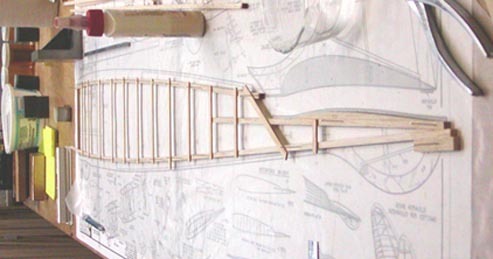 This picture is a better perspective of the fuselage frame and shows it to be long and slender like a thoroughbred. You can see that for its size, it is extremely light weight! 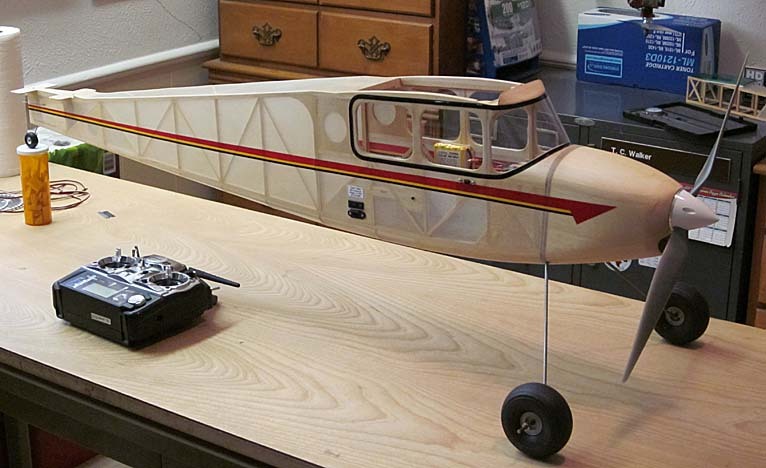 At this point, I discontinued the Sailplane project, which was my intent to begin with. Recently, when Mike Myers announced in SAM Speaks that he would be serving as the Contest Manager for the 2009 SAM Champs, which he was going to call the Comet Model Champs, my interest in the Sailplane was again aroused because “the model of the year” can be any SAM legal Comet model. Concerned over the complexity and functionality of the retractable landing gear of the Sailplane, I seriously considered selecting a scaled up version of the Class B Comet interceptor for my Comet model because the retractable landing gear on the Sailplane was simply in the “Too Hard Pile”! Then with some encouragement from Gene Wallock and Sergio Montes, I started thinking about a more conventional two-wheel fixed landing gear configuration for the Comet Sailplane and made the sketch below of a possible two-wire strut landing gear, which surprisingly does not detract too much from the Sailplane’s beautiful lines. At least for this afternoon, I have decided to commit to an R/C Assist version of the Comet Sailplane for my winter’s building project. 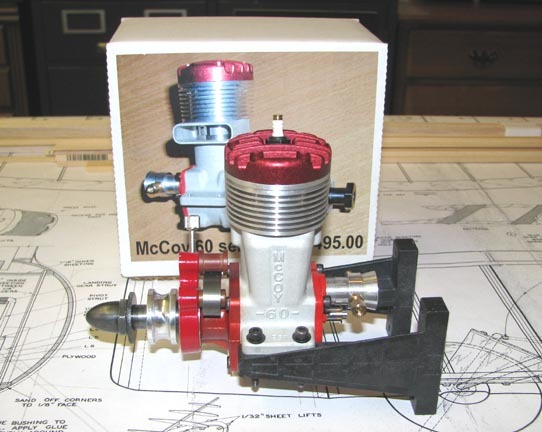 However, it is imperative that I locate another Series 20 McCoy 60 ignition engine for this project. Does anyone know one that might be available for purchase.